H: 32 cm (12,6″), W: 19 cm (7,5″). 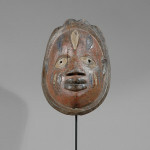 This old piece is a Gelede mask from the Yoruba tribe of Nigeria. It has considerable antiquity is a forehead mask, there are no eyeholes. The face is relatively small and low, with large almond-shaped eyes, a small, flat nose and straight, parted lips. The eyes are rimmed, and stand clear of the surface of the face. The forehead and cheeks have been subtly modelled to provide the curves and hollows of a real face. The dark red ground, beige/black eyes and further blue and beige highlights in the vertical double cheek scarring. 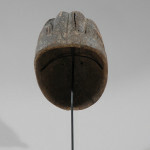 The back of the mask is plain wood, with clear signs of its having been worn over some period of time. The Yoruba are a Central Nigerian tribal group, originally descended from a Hausa migration from the northeast in about 900 AD. A small kingdom – Ile Ife – was founded by Oduduwa, followed by great sociopolitical expansion into Southwest Nigeria, Benin, and Togo. The influence of the city was felt far beyond these boundaries, however, and many smaller political entities were held under its sway. Communities were presided over by the Oba (king) and various senates (Ogboni), and councils made up of guild leaders, merchants and the lesser aristocracy (related to the Oba). 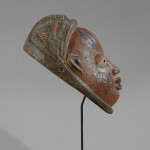 The Yoruba have an exceptionally rich and diverse mythology, history and religious context, all of which are directly linked to their artistic output; in Yoruba society, this grouped heritage is known as the Itan. 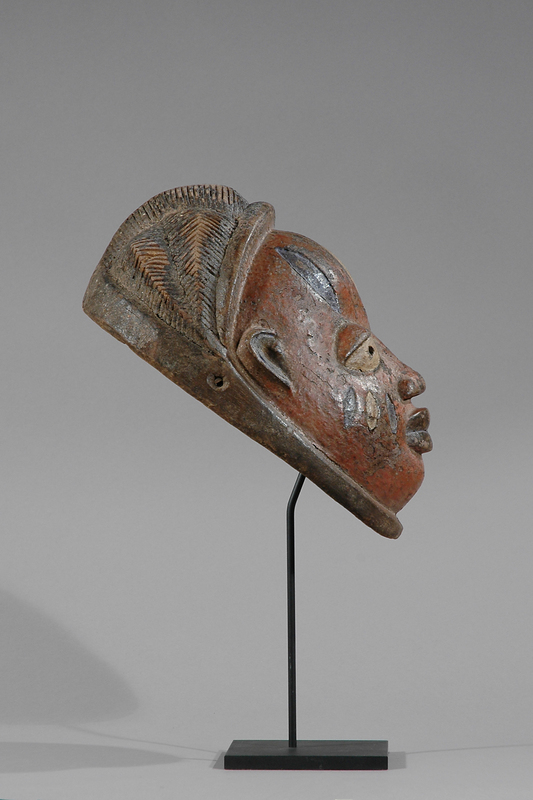 This fine polychrome mask is intimately associated with rituals performed by mens societies bent upon the protection of the living. Specifically, Gelede is intended to honour the spiritual aspects of femininity, and to prevent this from becoming destructive to the society to which they belong. Angered female spirits (Aje) may destroy entire communities; for this reason, they are placated by dancing performances so that their power is directed towards the benefits of the group. 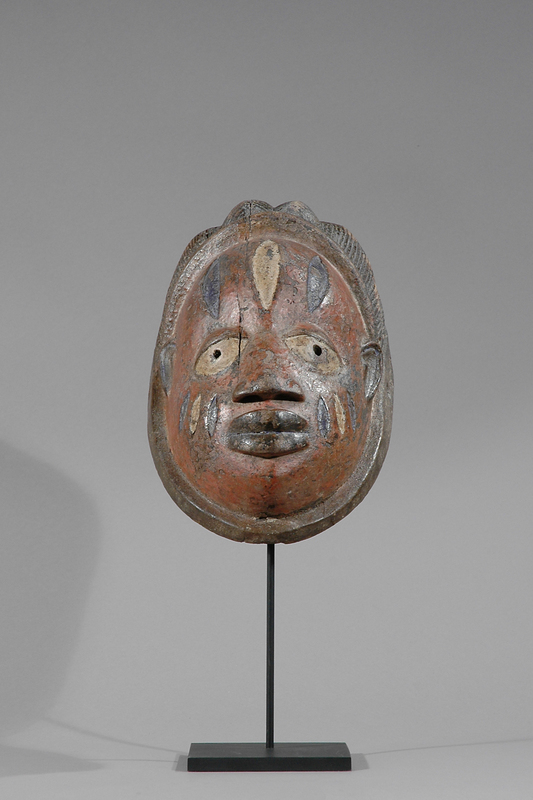 Each village and area had distinctive patterns of Gelede masks that reflect some facet of their social organisation or mythology. 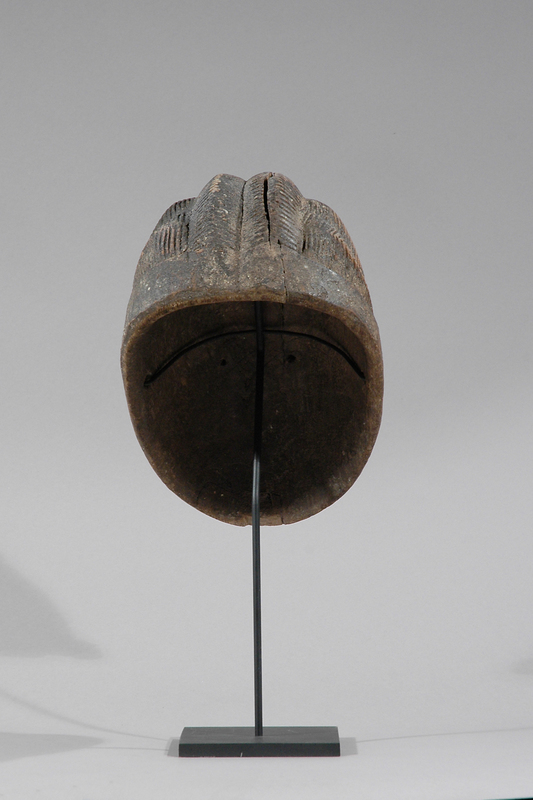 The current example is a well-carved and decorated specimen with extensive use wear and a good patina. 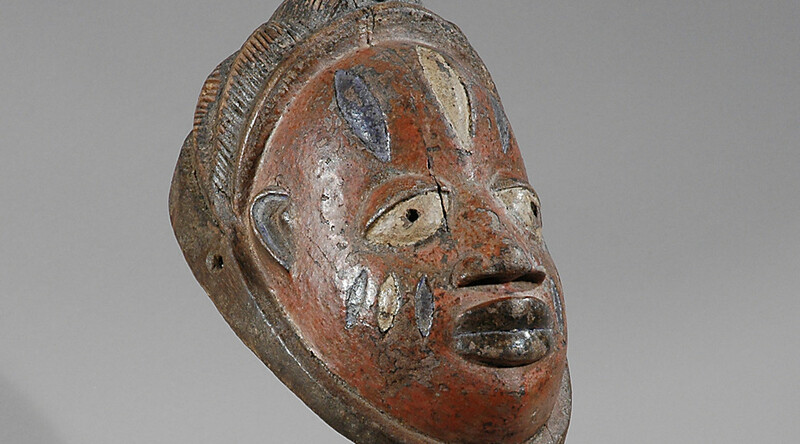 The nature of the painting places it in the post-conquest period, when African artists were exploring a variety of new ways of expressing themselves through the application of western paints etc in the decoration of traditional items. It therefore has considerable ethnographic as well as aesthetic and social value. This is a mature and well-executed mask.